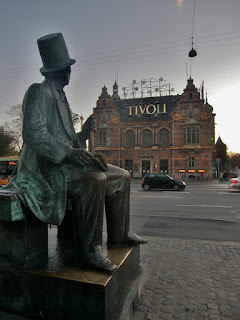 Upon my arrival in Copenhagen, I was greeted first by one of the oldest amusement parks in the world, Tivoli Gardens. Also one of the world’s most visited theme parks, Tivoli has not only rides, but also a pantomime theater and a classical concert hall. At night, the iconic entrance gate lights up its corner of Copenhagen adding a measure of cheerfulness to this already colorful city. Probably the most photographed area of Copenhagen is Nyhavn, a seventeenth-century waterfront along a canal reaching towards the harbor. Brightly colored historical homes and businesses in blue, yellow, red and orange energize and gladden as you stroll looking for one of the many places available for a meal, drink, or coffee. The best dessert waffle I had in Europe was along this promenade. After leaving the Nyhavn promenade, walk toward the delightful statue of The Little Mermaid in honor of Hans Christian Andersen who lived along Nyhavn. Beyond The Little Mermaid, Sweden’s Malmo is visible just over the Öresund Bridge. Cabled and understated with simple, Scandinavian lines, the Öresund Bridge is just one of many such bridges which bind Denmark together and with the rest of Europe. That is one of the things so wonderful about Denmark—the simplicity of modern design along with centuries-old architecture beckons you towards the past and draws you towards the future. Fyn is an island in the heart of Denmark offering both pastoral countryside and history-laden towns. Known as Denmark’s “garden island,” Fyn is ideal for exploring by bicycle. Rolling hills, thatched-roof farm houses, and a peaceful, bucolic environment make for a pleasant holiday. If this pristine countryside is not enough, consider this: Fyn is the birthplace of Hans Christian Andersen and the fairytale castle, Egeskov. Hans Christian Andersen was born in Odense in 1805; his birthplace home is now a museum and well worth a visit. One can see why Hans Christian Andersen was inspired to write fairytales just by seeing the Fyn countryside and visiting Egeskov Castle. Egeskov Castle is noted as being Europe’s best preserved moat Renaissance castle. The grounds feature various gardens, hedge mazes, a PlayForest, and a doll house, arguably one of the best in the world. Informative and fun, Egeskov Castle is a great destination for both adults and children. Another great place to visit on Fyn is Funen Village. Idyllic eighteenth and nineteenth-century, thatched-roof homes, period farm animals, and “living history”—villagers dressed in period clothing during the summer—provide an escape from the modern world. There is also a family theater for a couple of months during the summer. Do You Want the Fairytale to Continue? If you would like the fairytale to continue, consider this: International Vacation Home Exchange has an ideal luxury exchange home available on the island of Fyn. This 350-year-old manor has stunning interiors complete with a formal dining room. Outdoors boasts a parklike garden, a pond, and a forested area. The beach is just ten minutes away. See how this works, and read testimonials.